Discover what the Ten Commandments mean for us. See how a concern for respect underlies some commandments... and more. Icebreakers, Bible readings, eye openers, discussion starters, personal application and 'Seeing Jesus' sections make this a rich resource for group or individual study. Mary Evans is former vice-principal at London School of Theology, and she taught there for thirty years. She also spent three years teaching at the Ethiopian Graduate School of Theology in Addis Ababa. She has written several books and commentaries and has been a visiting lecturer on every continent... except Antarctica. Cover To Cover Bible Study The Ten Commandments by Mary Evans was published by CWR in June 2011 and is our 2345th best seller. The ISBN for Cover To Cover Bible Study The Ten Commandments is 9781853455933. 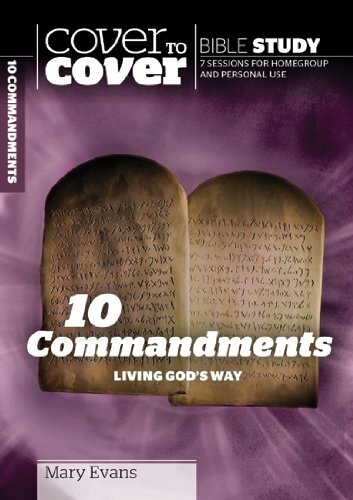 Be the first to review Cover To Cover Bible Study The Ten Commandments! Got a question? No problem! Just click here to ask us about Cover To Cover Bible Study The Ten Commandments.